Ernest William Branston was born in 1894 in Bottesford. In 1901 the family were living in a cottage on the Green. The children living at home were Frank Philcox (11), Florence Branstone (5), William (7), Annie (3) and John Branstone (8 months). By 1911 Fanny was a widow living on the Green with her family – Annie and Jack (John) in addition to Cecil (8) and Violet (4). William is not listed in the 1911 census as being at home. Nor is he listed in other census returns. At the age of 17 It could be that he was working away from home. It might also be that he had joined the army by then. The Chapel Roll of Honour lists him as being with the Royal Fusiliers. It also indicates that he was wounded at some point in the war. There is one only surviving WW1 record for an ‘Ernest William Branston’ with the Royal Fusiliers. 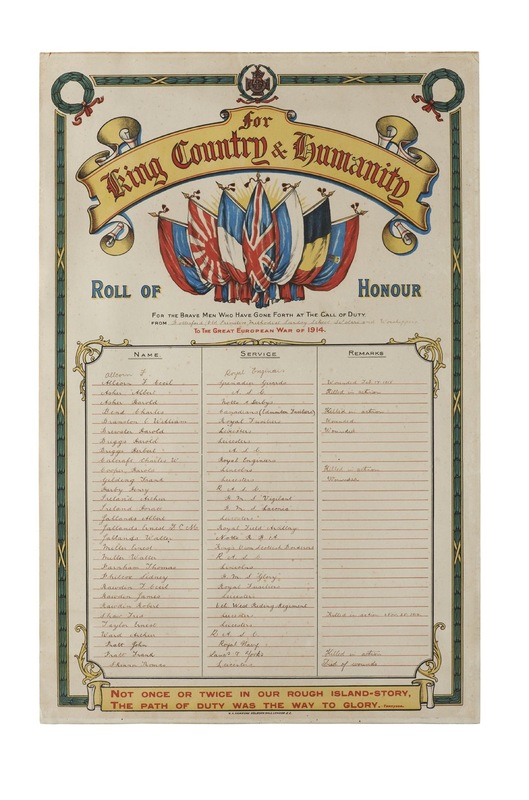 It is the “Roll of Individuals entitled to the Victory Medal and/or British Army medal for the Royal Fusiliers. The 3rd Battalion was a Regular Army unit. As war was declared they were serving in India only to return in December 1914 when they were relieved by a Territorial Unit. They then joined the 85th Brigade, 28th Division who were assembling near Winchester before transfer to France in mid January 1915. The dates given William Branston’s record would indicate someone who was a regular soldier. It is interesting to note that another person on the Roll of Honour, Frederick Cecil Rawdin was a Sergeant with the Royal Fusiliers, serving at the outset of the conflict with the 2nd battalion. His and William Branston’s service numbers are consecutive. This could indicate they joined up together. If that were to be the case then this would add to the strength of any argument that Royal Fusiliers Medal Roll record for Ernest William Branston is the person from Bottesford.